I really admire the delicate touch filigree lends to jewelry. I'd like to see more of it in goth jewelry styles. 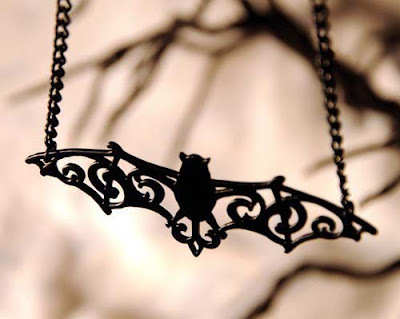 So I'm delighted to find this filigree bat necklace from the Fable and Fury shop on Etsy. 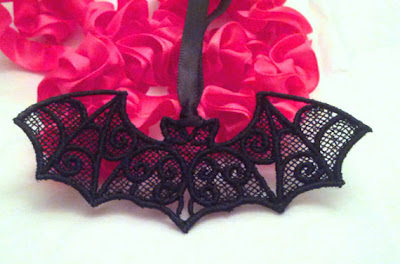 I would also love to see more lace used in jewelry like this pretty lace bat necklace. This "Elvir's Tryst" bat necklace features multiple interlocking bats, and then a black drop pendant. This is the first upside down hanging bat I've seen in jewelry. I'm surprised there aren't more designs showing sleeping bats like this. I love that this bat is a bit furry! I would never have thought to put a bat on a cameo necklace. This is beautiful! I probably like this bat fairy necklace so much purely because the little girl has such a bratty expression on her face. I have a necklace that looks almost (if not exactly) exactly like the first necklace. And I got it for three dollars at walmart.